Behind the scenes in every staffing agency is a team of payroll and billing professionals who are often underappreciated for their contribution to the success of the company. They are the ones who ensure that employees are paid invoices delivered on time. They may also handle light collections and occasional payroll issues as they arise. Just like the front office, your back office staff can benefit from the right workforce management system. 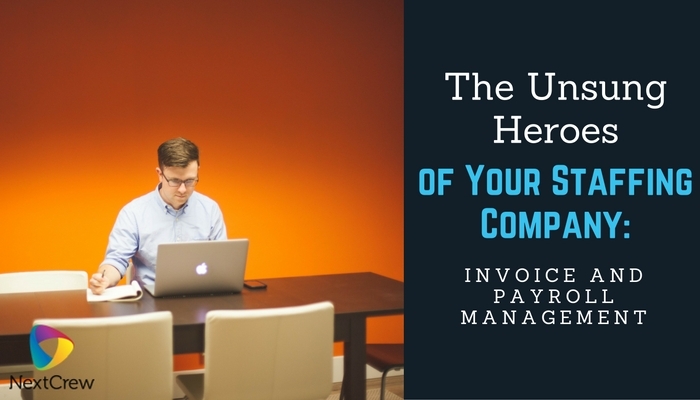 In fact, it can save your company more than 50% of cost in terms of processing payroll and invoices. When you keep in mind that your payroll department may have to key in all the data by hand it can seem like common sense to find a way to automate the system. So by connecting your front end software with your back end payroll system, you can save both time and money in the long run. At NextCrew, we believe in creating a powerful eco-system within a company by connecting both systems using our powerful open API. Many of our clients use QuickBooks, either online or an enterprise version. Our system can be integrated with QuickBooks so payroll and billing information is automatically shared between front and back office. Then, it is a simple point and click to run payroll and create invoices. But QuickBooks isn’t all we can offer. Our system can also integrate with Paychex and other back office management systems on the market today. So, if you want to be sure that your back and front office and integrated and running smoothly, consider a workforce management system that handles all aspects of your business. Contact NextCrew to learn more today! 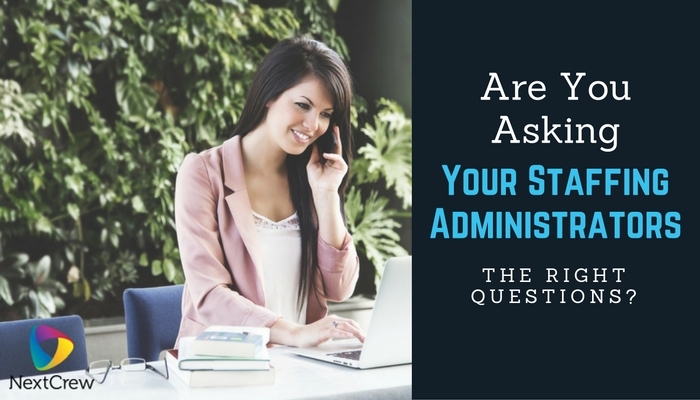 Are You Asking Your Staffing Administrators the Right Questions? As the owner of a staffing agency, you need to be prepared to answer a multitude of questions surrounding the success of your business. So, are you answering the right questions to begin with? To know, you need to better understand which questions you’ll be asked. Before you begin a sales pitch to your next client, here are some of the questions you might need to ask yourself and be prepared to answer. Do you have enough of the right talent for your clients? It is nearly impossible to fit a square peg in a round hole. An agency works hard to ensure they have the right candidates at the right time and the right place, so how do you source candidates and effectively place them on the job? How is information updated in your database? With the right workforce management solution, you can let your clients know that employee information is updated by the employees themselves. This makes your database more accurate overall and easier to search. How do you engage your employees to keep them happy? As an agency, your product is your people. And in order to place individuals successfully, you need to ensure that they are satisfied with your service as well. What do you do to keep them engaged? Do you have the technology to make client interaction easier? What can this new client expect in regards to utilizing your agency on a regular basis? How do they submit requisitions for jobs and interact with potential candidates? Is your database optimize for mobile? Do you have a mobile interface for both clients and employees? Accessing information quickly and easily with a smart phone or tablet is a top priority for many individuals today. How fast are staffing coordinators able to fill jobs? What is your typical time to hire? If your agency uses a workforce management system, your recruiters will be better able to focus on finding new talent rather than daily administrative processes, increasing the fill rate. What added value does your service provide? What makes you different from your competition? What can you offer in the market place that will provide added value to your clients and candidates? How do you collect data and use it to enhance service? With a workforce management solution, you’ll be able to collect additional data that can be used to help your client better understand how their business is benefiting from your service. Info on top performers is just the beginning. How efficient is the payroll process? The payroll process can be a pain, and if a client is used to a less efficient method they may be concerned. Can you offer new and more effective ways for employees to submit their time sheets for approval? How am I invoiced and how can I pay? If the payroll process is automated by your workforce management system, is invoicing also optimized? How do you send invoices to your clients and what are your terms for accepting payments. If want to provide positive answers to all of these questions, contact NextCrew to learn more about our product and how we can partner with your service today! If you’re a high volume staffing company you know it’s not always easy to fill short-terms jobs. You may have thousands of candidates in your database, so efforts are wasted when you call, email, and text each one manually to find the right person for the job. Each candidate also has a different preference for how they like to communicate. And, in a world where social media dominates, the new generation would rather manage their own time and profile. For a staffing company to retain top talent it’s essential to provide them with all the right tools. Offering a self-directed method to applicants can save time for staffing coordinators and ensure that new profile information is accurate and efficient. NextCrew offers cloud based solutions to help staffing companies lower their operations cost by managing their contingent workforce more efficiently. Our technology offers self-service option for employees to manage their profile and apply for jobs with a single click. They can also easily update time-sheets via web app or mobile app once they’re on the job. Profile management. They can update their availability, training, certifications, contact information, and more. Job Management. With one click, they can apply to jobs via text, email, website, or mobile app. The system can send notifications to candidates based on skill, location, and availability. Time-sheet management. Getting hours from candidates no longer has to be a bottleneck in the system. Your employees can update their hours directly on the mobile app. Interactive SMS. For many applicants, text messaging and mobile apps are the preferred method of communication. Rather than fighting it, use it to your advantage. With our innovative interactive SMS communication platform, employees can instantly accept or decline a job request and the response is displayed in your system in real time. Mobile application. Optimizing your system to smart phones is good business. 1 in every 10 users access the internet exclusively through a mobile device. This will allow more of your candidates to stay in communication and be notified about jobs. GEO Check-In. The app that will be integrated to your system also provides a GEO check-in that allows your staff to check in and out for different jobs as they go to work for you. 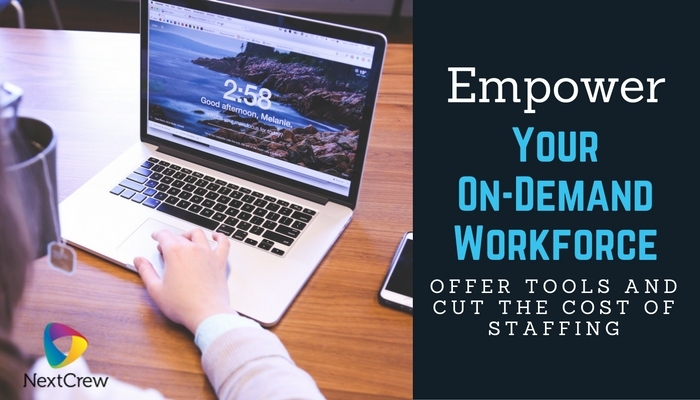 If you provide temporary staffing, you need to consider offering these tools to your workforce. It can only enhance your business and their overall experience. Contact NextCrew to learn more and get a free consultation or demo today!